After you have created at least one AutoResponder profile, you can manage that profile and others by choosing Post Processing > AutoResponder Emails & Redirect Options in the Form Designer Toolbar. You can also right-click on the form in the Dashboard, then select Form Design Tools > AutoResponder Emails & Redirect Options. When the AutoResponder Profile window appears, you can view the AutoResponders that already exist for this form, and manage them using the menu items in the toolbar at the top of the window. To add another AutoResponder, select the Add AutoResponder Profile menu item and then follow the steps in the topic Creating AutoResponders. To delete an AutoResponder, select the row containing the profile and then click the Delete Profile menu item. Click Yes to confirm your choice or No to retain the profile. Select the AutoResponder profile and then click the Edit menu item. Or, you can double-click the AutoResponder you want to edit. In the Rules tab, you create rules to control which AutoResponder profile is used on a form submission. For example, you might create one AutoResponder profile for Canadian recipients containing a rule that checks the value of a Country field for the selection "Canada". You could create a second AutoResponder profile for U.S. recipients and add a rule that checks the Country field for the value "United States". Rules are executed in the order shown in the listing. If a condition exists that matches one of the rules, processing aborts at that point. If you have created at least one form view, you can choose "Form View" in the filter drop-down, and then choose one of the views in the value drop down. 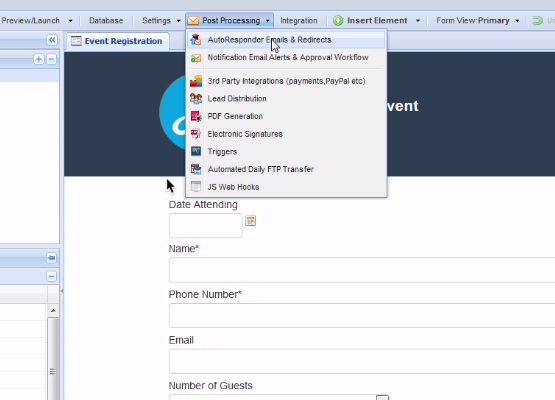 This configuration allows you to run an AutoResponder that corresponds to the Form View used for the form submission. Only one AutoResponder Profile is every used per form submission. Even if you create multiple Profiles and Rules, after the first rule match further processing is aborted. Remember also, that if no rules match, your default profile is used. If you want to send more than one response email, you can use a trigger.